Roger Federer, the "housewife killer" (often refers to men who are popular among the aunties/housewives, in Cantonese) is back in Basel! 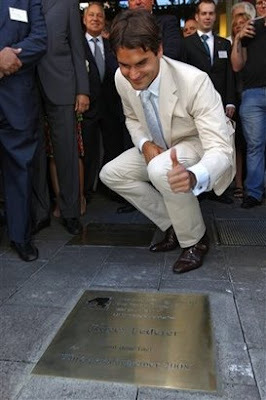 The world no.1 and living legend is back in his hometown to attend a ceremony to unveil a honour plate bearing his name at the Basel "Hall of Fame" on July 16, 2009. 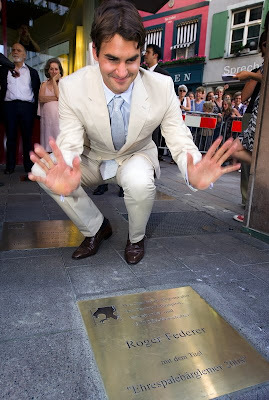 Federer was named "Ehrespalebaerglemer“, a title that honours people who give outstanding services for the city. I can't believe it takes 15 Grand Slams to get Federer that piece of plate! I wonder how many plates are there altogether in Basel.